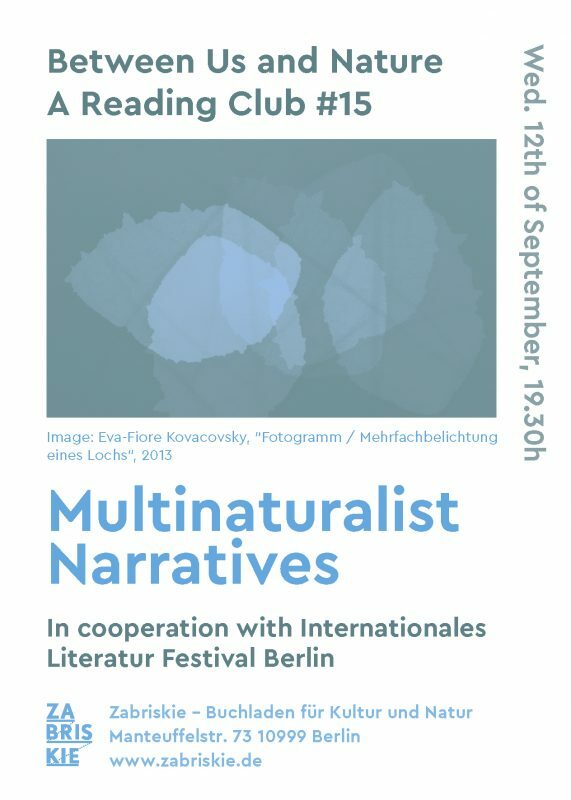 Within the special ‘Nature Writing’ program of the 18. international literature festival berlin (ilb), in session #15 of our ‘Between Us and Nature – A Reading Club’ we will explore multinaturalist narratives from alternate cosmovisions. In ‘Between Us and Nature – A Reading Club’ we read texts together related to natural sciences, art, anthropology, postcolonialism, and (post)anthropocene, chosen from a female perspective looking beyond disciplines. Those who would like to attend the reading session, please rsvp via email to betweenusnature@gmail.com, and you’ll receive a selection of texts. Eduardo Viveiros de Castro: Multinaturalism in ‘Cannibal Metaphysics’, ed. Peter Skafish, Minneapolis: Univocal, 2014.